• Moisture resistant shape at the pinnacle of power and beauty, industrial and structural design. Encompass stability control system, features light weight, strong payload, and long flight time. 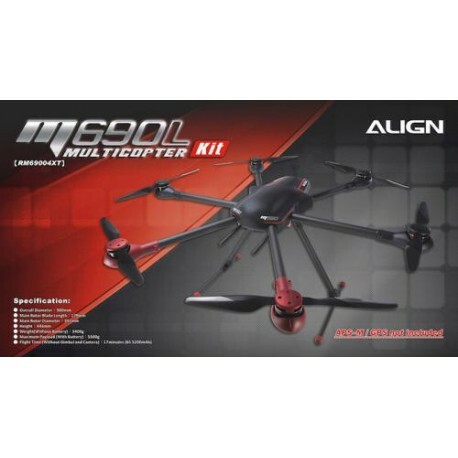 Superior in both high speed agility and static stability, this multi-purposed professional multicopter exceeds in all areas such as aerial photography or as leisurely sports flyer; yet its light weight allows for easy transport anywhere. • The innovative streamlined moisture resistant canopy features screw-less quick latch mounting design that is easy, quick, and reliable. In addition, canopies with variety of multi-colored graphics are available for customization by enthusiasts. • Twist off screw enables quick folding of the rotor arms without any tools. Once folded, the overall size is greatly reduced for easy transport. The highly rigid industrial grade fiber composite plastic main rotors are quiet and aerodynamically efficient, providing higher efficiency and longer flight duration. The main rotors are also foldable for ease of transport. • Unique common platform allows for both highly agile 4 rotors, or heavy lifting 6 rotors, configurable by user based on needs. Matte finished carbon fiber matched with highly rigid industrial grade plastic for overall weight reduction and increased rigidity. In addition, the matte finish is effective in minimized unwanted glare which affects camera imagery, while increase the aesthetic of the overall product. • Low noise, highly reliable all metal retractable landing gears. Minimalistic design proven with 20,000 repetitive actuation longevity tests. The retracts enables zero blind spots for the camera, while providing superior longevity. 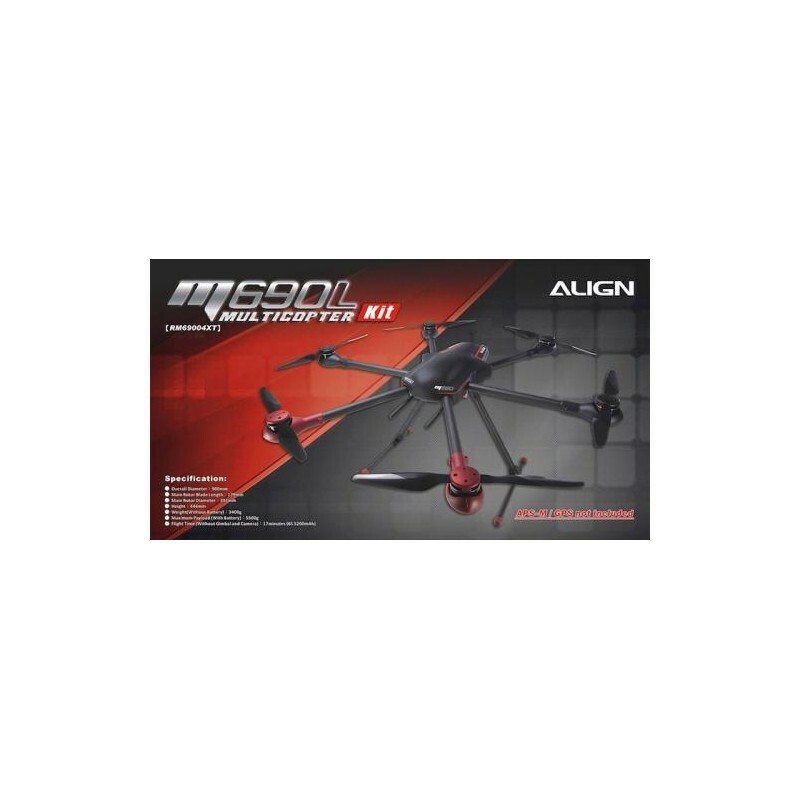 • ALIGN′s brand new, multicopter specific BL4213 370KV brushless motor inherits ALIGN′s core motor technology, featuring high torque, high efficiency, low power draw, and low temperature. The superior performance enable 20 minutes flight on empty M480 using a single 6S 22.2V 5200mAh battery, and 9 minutes with G3 gimbal + Panasonic GH4. • Individualized design! These light weight carbon fiber motor mount housing are made with an unique manufacturing process, and features tough, highly visible, and shock absorbing characteristics. Colors can be intermixed for that unique look based on your preference. • The highly rigid industrial grade fiber composite plastic main rotors are quiet and aerodynamically efficient. Multiple colors are available for enthusiasts to customize their look. In addition, light weight and highly rigid all carbon fiber main rotors are also available which features even higher flight efficiency and longer flight duration, while providing faster and more precise flight response. • Multi-function system control panel consists of power button and battery status indicator. The power button eliminates complicated power-on sequence; just a simple press to activate power. The battery status indicator displays live battery capacity for a quick view of remaining power. In addition, the APS-M status indicator is also integrated here for pilot to read the current flight modes. • Motor mount made with carbon fiber embedded injection molded industrial grade plastic are streamlined shaped, and features high rigidity, light weight, and vibration absorbing characteristics. 40A high speed Electronic Speed Controller (ESC) are embedded within the motor mount which can reverse rotation, and features a high luminous LED for flight orientation. The LED color can be switched between red and white based on needs, as well as provide low voltage warnings. • Quick release battery mounting plate and rail to allow for single handed quick battery replacement. Double decker battery mounting plate design to allow for single 6S (up to 12000mAh size dependent) battery, or two 6000mAh batteries. This system allows for flexible battery selection and variable CG adjustment. • Gold bullet connectors are rated for 100 amps, with patented built-in anti-spark system at the tip of battery mounting plate. This systems eliminates long term wear and damages to electronics from poor connections of worn plugs, and provide a safe and reliable connection. • Intelligent Power Control Unit (PCU) acts as the center piece for power and signal management, distribution, and control. With a single battery, the system distributes power to motor, flight control, gimbal, retract, downlink system, etc. In addition, it integrates all signals between APS-M, G2/G3 gimbal, OSD, and the data downlink system. It also controls gimbal′s panoramic photo mode, fix point photo mode, and retract system. The system will automatic power off in 3 minutes after aircraft has landed and remain stationary. The PCU system provides the most safe and reliable management of all power and signals on the multicopter.